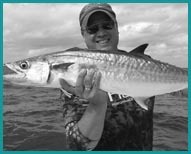 Rates - Up to six anglers. When you book with Total Fisherman, you're booking the entire boat and it will just be your party on-board. The below rates are for the boat and you can bring up to six anglers. Fishing licenses are included, you just need to bring whatever you want to eat and drink. We have bottled water on-board. To book a trip requires a 20% deposit to hold your date. Upon booking you will receive a confirmation email from us with all of the details of your trip as well as driving directions to the marina. Deposits are refundable if canceled more than two weeks out from your trip. If Total Fisherman Guide Service cancels for any reason you will receive a full refund of your deposit. Cancellations on our part are rare but mechanical or weather issues may arise.